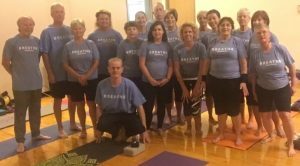 One of KAIRE’s mantras has always been “Breathe.” So when the Harrison County, Indiana YMCA yoga class made a special request for some KAIRE Breathe t-shirts, we dug through the storage room to make it happen. Abby Coffman teaches this all-ages class. We think the shirts look great! Namaste! We’re Stuck on These New KAIRE Stickers! KAIRE just got in some new promotional stickers, and we’re happy to say, we love’em! They look equally great on a folder, a reusable water bottle or a clipboard. 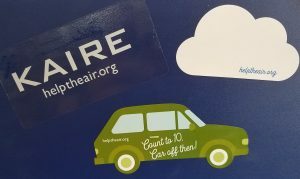 In fact, we think they would look great just about anywhere people need a reminder to help the air. Saturday, July 14, 2018, is an Air Quality Alert Day for ozone in Louisville/Southern Indiana. Forecasters believe ozone will be in the Unhealthy for Sensitive Groups (orange) range. Sensitive groups include seniors, children, and people with breathing ailments like asthma and COPD. The general public is not likely to be affected.